Do you have sensitive and acne prone skin and looking for a safe cleanser and skincare regime? Ecobeau’s antimicrobial and anti-aging properties help to stimulate skin cell’s regenerating system. It may not show immediate results as synthetic and harsh skincare products out in the market which many a times only provide temporary efficacy. Its antioxidant extract from herb medicine diminishes wrinkles and acts as natural source of whitening. 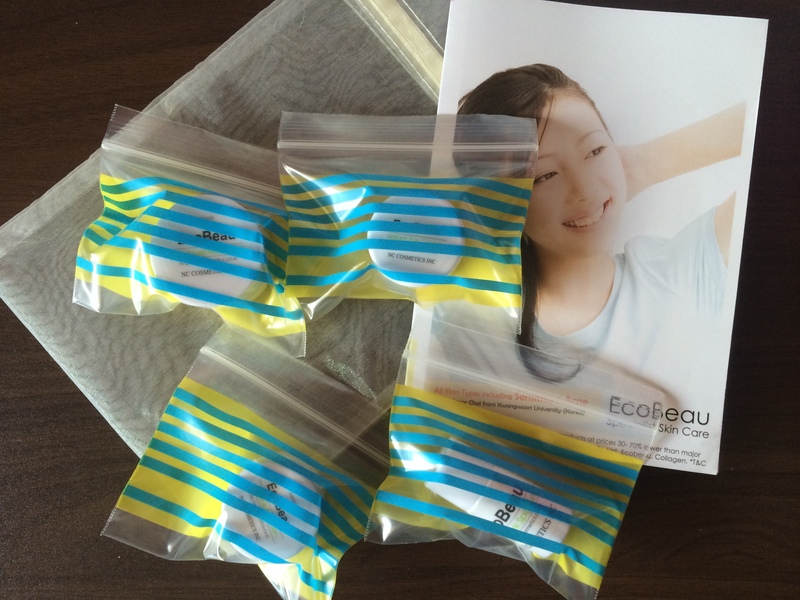 Continuous use of Ecobeau line will give you bright, moist, smooth, resilient and clear lustrous skin. 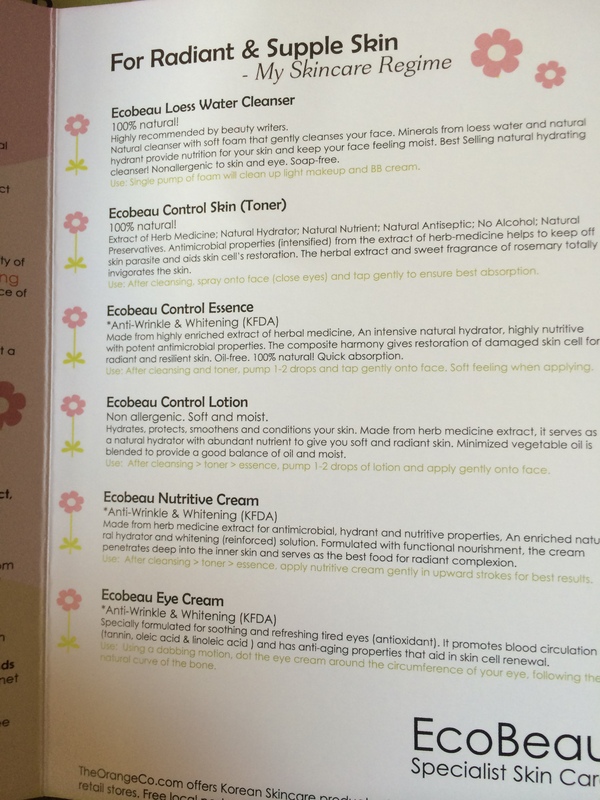 Ecobeau was exclusively distributed by specialist skin care centers in Korea. Now launched at www.TheOrangeCo.com. Enjoy natural rejuvenating skin treatment at home, at a fraction of cost charged by the luxury skin salons. Simply Natural and Restorative for the Skin. Free from alcohol, synthetic preservatives, parabens, sulfates, paraffin wax, petroleum, mineral oils, gluten and artificial colorants. No Synthetic Preservatives. No Alcohol. No Parabens. A sweet personal note from June of TheOrangeCo. 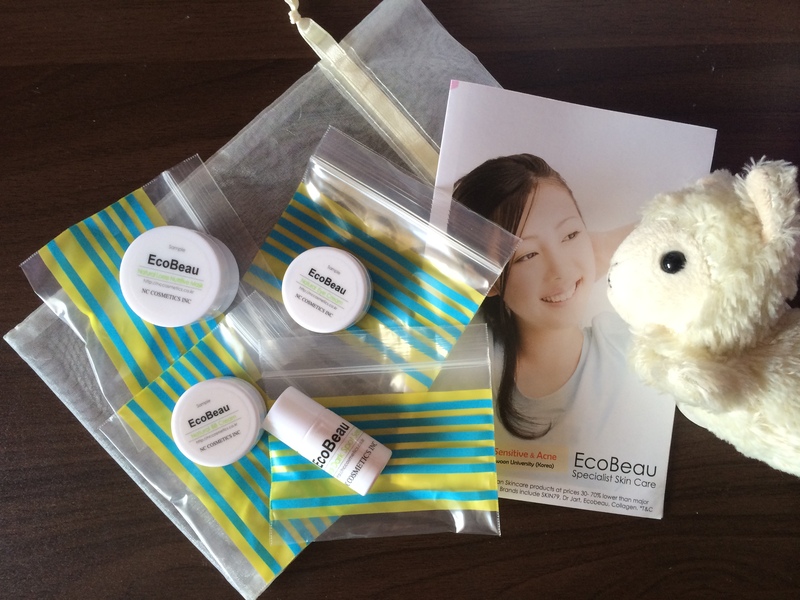 EcoBeau products, very clinical packaging, practical and nothing fancy. 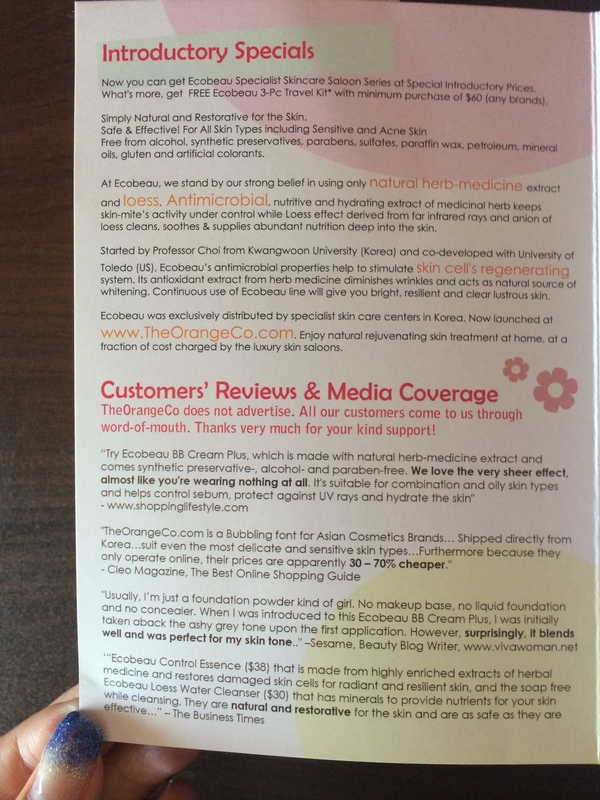 TheOrangeCo.com houses top selling brands of skin care and BB cream (blemish balm) for customers to shop comfortably online. Customers can choose from popular Korean brands such as Skin79, Dr. Jart+, Laneige, Ecobeau and some of the hottest blemish balm (BB cream), collagen, Q10, whitening and anti-aging beauty products at discounts. Our online prices are predominately 30-70% cheaper than listed prices at major stores. That’s because we only operate online and do not pay notoriously high rental for physical stores, and therefore able to pass considerable cost savings to consumers. 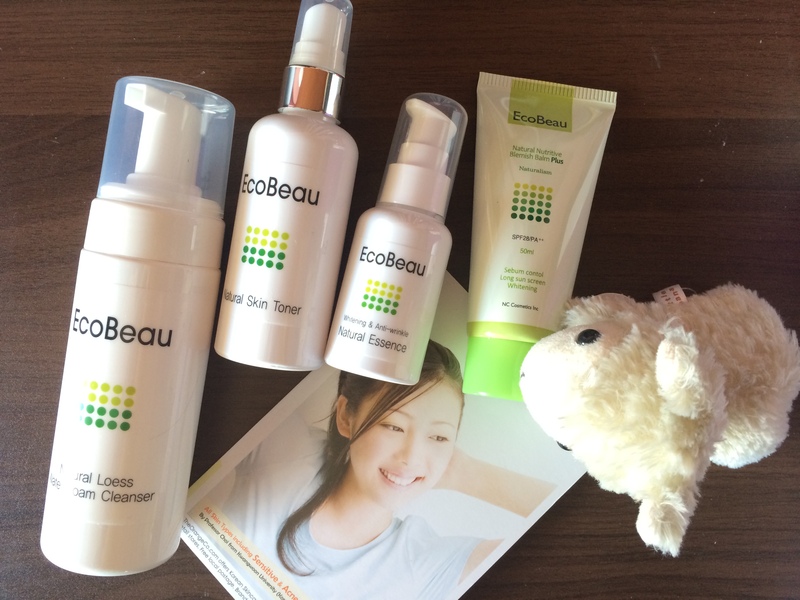 Get EcoBeau Skincare at Special Introductory Prices. Also includes rave reviews from various online sites and The Business Times. 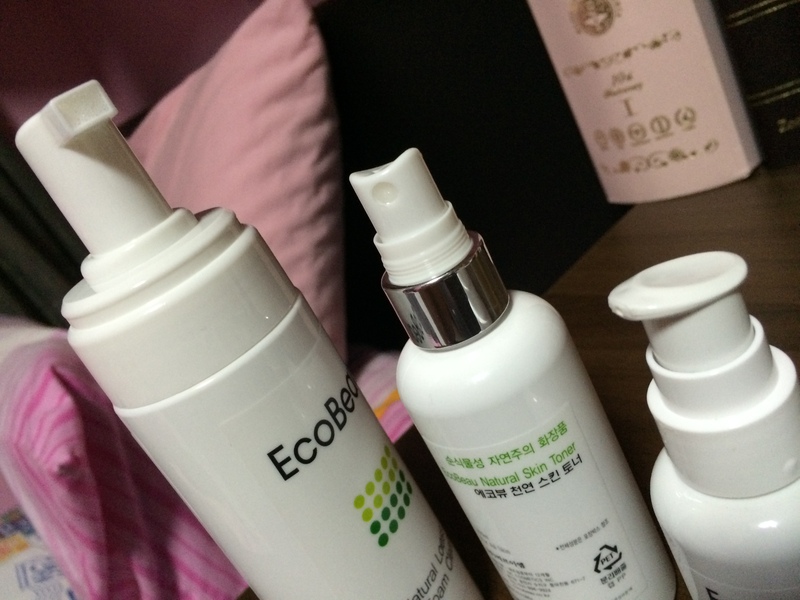 Write up for EcoBeau Loess Water Cleanser, EcoBeau Control Skin (Toner), EcoBeau Control Essence, EcoBeau Control Lotion, EcoBeau Nutritive Cream and EcoBeau Eye Cream. The cute travel set that I also received. Love the candy-like striped zip lock bags. 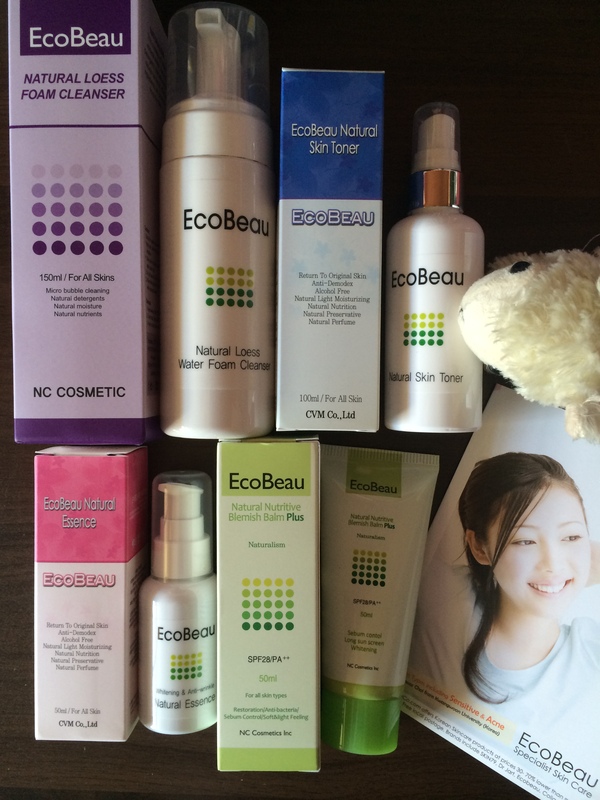 Travel set here includes (Top Left, Clockwise): EcoBeau Natural Loess Nutritive Mask, EcoBeau Natural Eye Cream, EcoBeau Natural Dark Spot Serum, EcoBeau Natural BB Cream. Very lightweight packaging and definitely convenient for travel! Probably able to fit 3 day’s of products, perfect for a weekend getaway. First off, I love the packaging. Each of the skincare product comes in a very hygienic dispenser nozzle. And of course with the caps. 1. 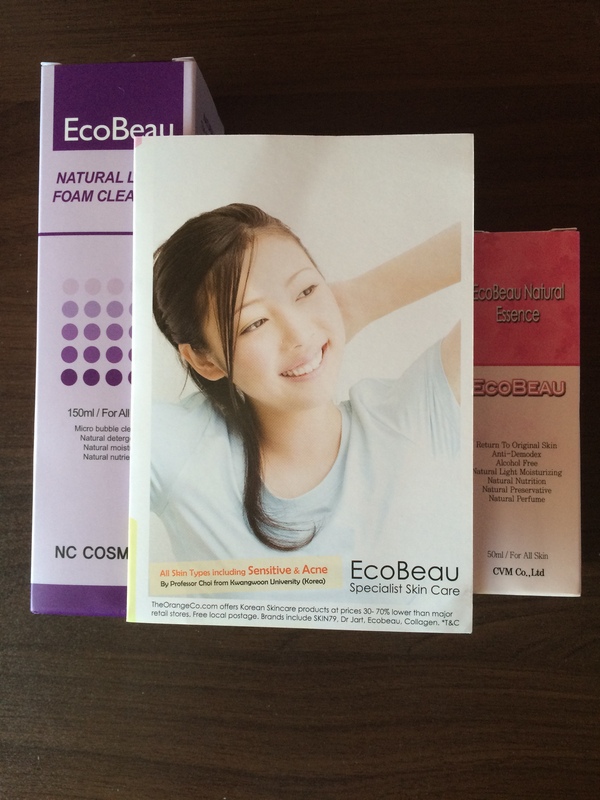 EcoBeau Natural Loess Water Foam Cleanser. Use: Single pumping of foam will clean up light makeup and BB cream. Nonallergenic to skin and eye. Soap-free. Recommended for all skin types. Made in Korea. Ecobeau Loess Water Cleanser is formulated from natural loess harvested from mother earth. Depending on the loess minute mineral harvested, product may vary slightly in colour, scent and sometimes with mineral sediments. That’s because Ecobeau Loess Water Cleanser is 100% natural, with no artificial colouring and preservatives. Loess is minute mineral matter that aids health by emitting infrared rays, and has excellent absorptive, purifying, and revitalizing properties. In one tables spoon full of Loess, approximately 200 million microscopic organisms can be found, and those microscopic organisms have abundant supply of enzyme called ‘Catalase’ that breaks down oxides, which also have the effect of anti-oxidant; reduce heat, metabolisms and relaxation. Loess is a geologically recent deposit of silt or material which is usually yellowish or brown in color and consisting of tiny mineral particles brought by wind to the places where they now lie. It is a product of past glacial activity in an area. It is a sedimentary deposit of mineral particles which are finer than sand but coarser than dust or clay, deposited by the wind. Loess is a type of silt which forms fertile topsoil in some parts of the world. The closest thing I can draw a parallel with is humus, which is essentially rich, fertile soil aka decomposed organic material, except that Loess is more like past-glacier-enriched-sand. I enjoyed using this product very much. It’s very user friendly, 1 single pump results in a palm full (my palm anyways) of foam that doesn’t require any lathering. The scent is refreshing and “aqua” and the foam is very gentle. 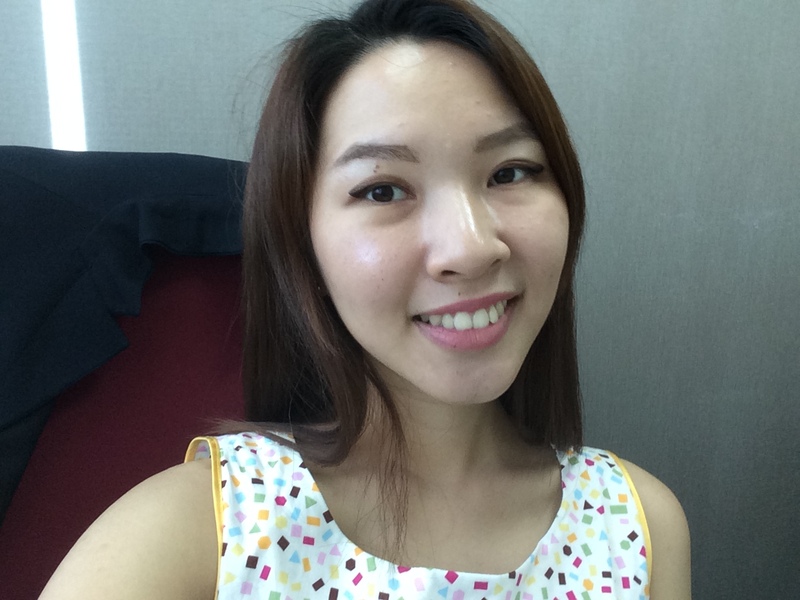 It gently cleanses my skin and it leaves the skin fresh and hydrated, no taut feeling. I recommend this for sensitive and acne prone skin. This is how the foam looks like, very dense bubbles and fine foam. UP. S$42.90, now S$30, available here. Antimicrobial properties (intensified) from the extract of herb-medicine helps to keep off skin parasite and aids skin cell’s restoration. The herbal extract and sweet fragrance of rosemary totally invigorates the skin. Ingredients: Water,Houttuynia cordata Extract, Gingko biloba leaf extract, Sesame seed extract, Padina pavonica thallus extract, Artemisia vulgaris extract, Rosemary leaf extract, Aloe Leaf extract, Aloe Barbadensis Leaf Juice, Zanthoxylum Piperitum Fruit Extract, Pulsatilla Koreana Extract, Usnea Barbata(Lichen) Extract, Glycerin, Sodium Hyaluronate, Allantoin, Rice Bran, Oatmeal, Arbutin, Collagen, Ubiquinone, Sodium Carbonate, Elastin, Adenosin. Likewise with the Foam Cleanser, I enjoyed using this toner because it’s light on the skin and leaves it refreshed, hydrated. This toner does not leave my pores feeling taut. Like the foam cleanser, its effects will not be immediate overnight but after 2-3 weeks for healthier skin. 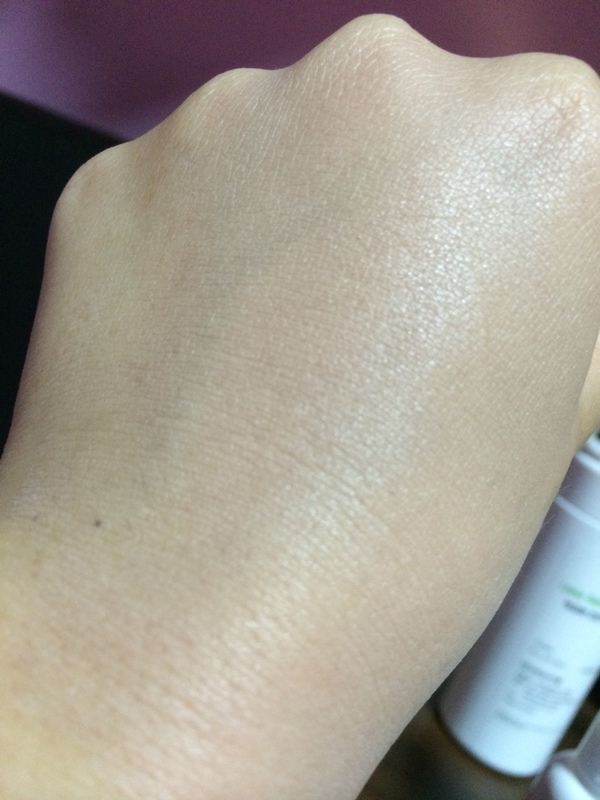 This is how the toner with water like qualities look like on the hand. 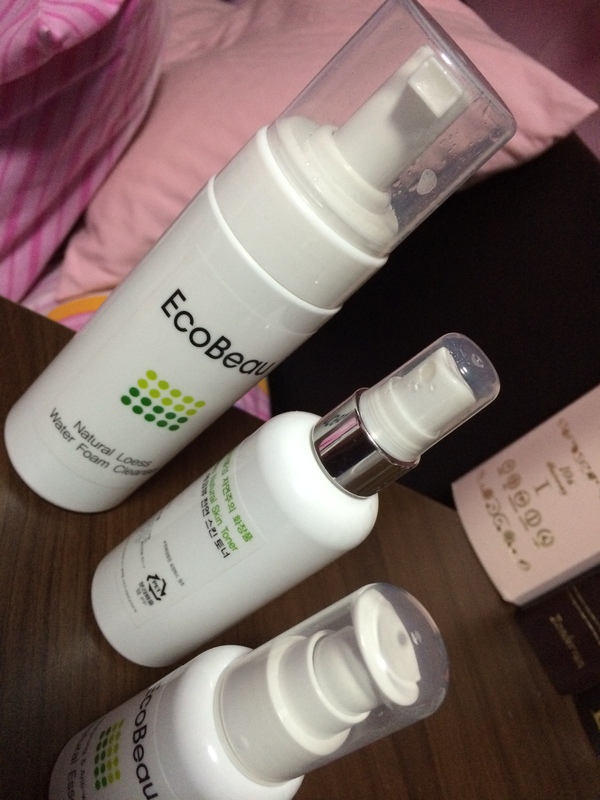 Similar to the cleanser, this is one of Ecobeau’s best sellers, now available here at UP $32.50, now S$28. 100% Natural Essence! orSweet scent of rosemary. As good as it smells! All skin types including atopy skin, acne-prone skin and face with freckles, liver spots, dark spots. Especially recommended for Oily/ Combination skin type. Unfortunately for me, this essence does not seat well with my skin as it’s “highly enriched extract of herbal medicine, highly nutritive” ingredients was too rich for me. :((( I tried it on 3 consecutive days, first two on my forehead which gave me pimples the next day, after which I wondered if it’s possible that I was having a hormonal induced outbreak (but I rarely have pimples on my forehead), so I tried it again, this time as a spot test below my chin, at my upper neck area and true enough it was too rich and I had a pimple.At this point you must be wondering why I’m so brave to test it directly on my skin, guess I can say that thankfully my skin is pretty good and not that sensitive and plus I have a lot of faith in EcoBeau products and generally have a very favourable view and experience with their other products. 🙂 So I will be passing on this product to my mum and I recommend this product for women and men who have dry-er skin, vs folks who have normal and oily T-zone like me, this would probably be too rich for you. 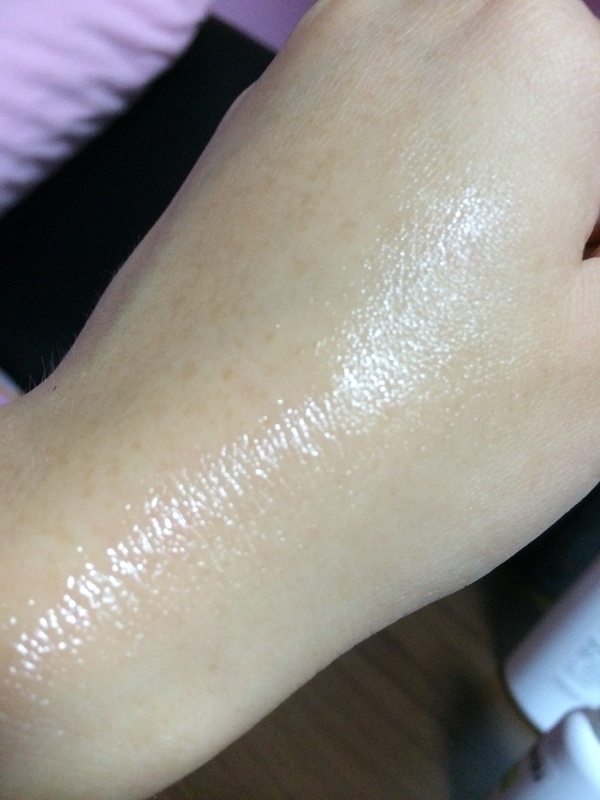 The EcoBeau whitening and anti wrinkle essence on my hand, it’s a gel like texture. Available here, UP S$76.60, now S$38. Natural Base BB Plus Cream is formulated from herb medicine extract, natural hydrant, vegetable oil and natural nutriment. It helps to shield off harmful UV rays, acts as makeup foundation, provides nutrition and hydrates the skin (multi functional BB cream). With added sebum control properties, it helps to control oil secretion and maintain clean matte finishing. Use: Apply small amount over the face evenly. Sheer and light coverage. Dash a thin layer of pact or loose powder if you prefer better coverage. Suitable for combination/ oily skin type. All skin types except highly sensitive skin due to sun screen added. Specially formulated for oily and combination skin types. Tip 1: Ecobeau is free from synthetic preservatives and alcohol. Nevertheless, if you have highly sensitive skin condition, do spot test for allergy before actual use. Refer to Skin Care Tips on website. Tip 2: Ecobeau BB Plus is specially formulated for ladies who prefer natural and sheer coverage (matte finishing). To apply, squeeze out bean-size BB cream and dab onto 5 spots (cheeks, eye area, fore head, chin and nose area) of your face after your usual skin care regime (cleanser -> toner -> moisturizer). 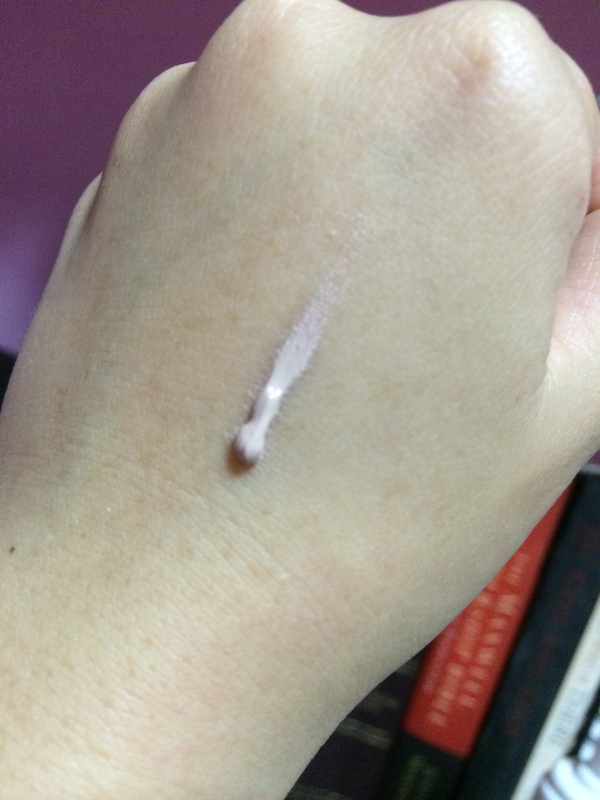 Pat and gently spread the BB cream in outward direction to ensure a natural and good spread of the cream. Don’t be worried if your face appears a little fairer than usual. It will settle in after a while. Pat a few times (gently) to warm up the skin and enhance adsorption. For ladies with eye circles, you may wish to increase the coverage at the eye area for flawless finish. Unlike foundation, BB cream does not clog the skin and when used in the long run, will improve skin condition and even out skin tone. I have tested and used this BB cream and I like it for its sebum controlling effect and its matt finishing. This is a BB cream that is perfect for days when I know that I’ll be out and about and I don’t want the oily effect on my face. If you’re looking for that currently trending dewy Korean girl look then this is not what you’re looking for. My tip would be to use this for your oily T-zone and then a normal BB cream, such as their Ecobeau BB Cream (New! Smoother & Natural Shade) for the rest of your face. Using the EcoBeau Natural Nutritive BB Plus Matt. No filter. Coverage is moderate. It’s specially formulated to feel and look matte. BB Plus Matt UP $49.40 now S$33 here. BB Cream Smoother & Natural UP $49.40 now $30 here. The BB Plus Matt. Beige with slight grey undertones. Applies with slight grey undertones but blends completely when applied. 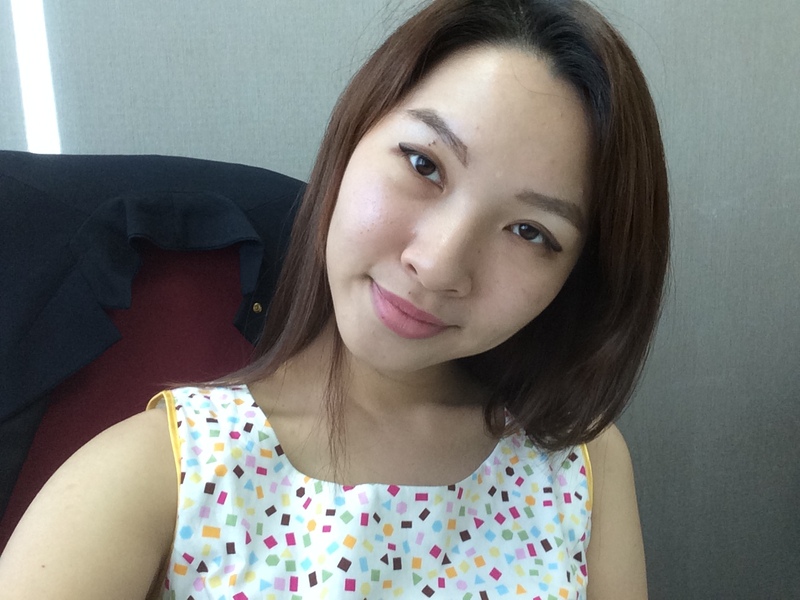 For comparison, my skin tone’s a NC 20 (MAC), Natural 05 (Elizabeth Arden) and 02 (Kose). Want to win a set of products that I’ve reviewed? Plus 4 more winners from the same giveaway will win the travel set (Lamb-y soft toy not included). 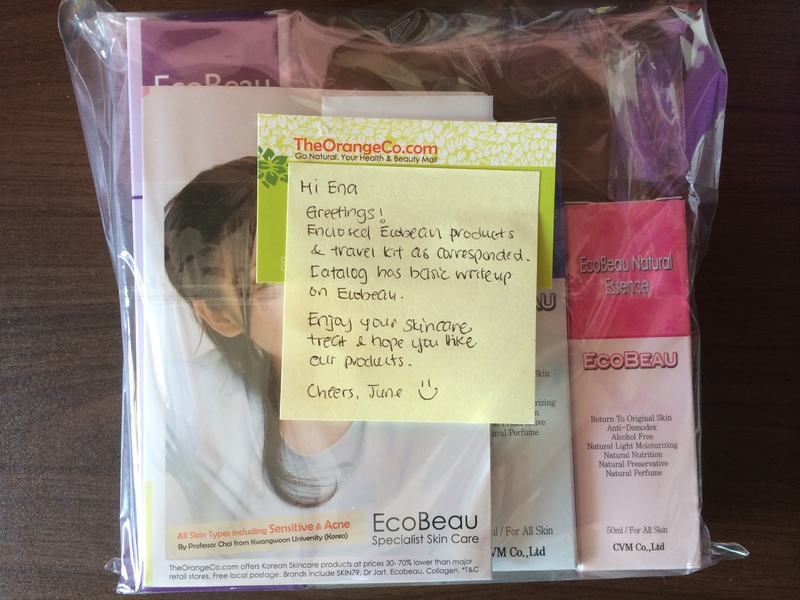 Thanks to TheOrangeCo and EcoBeau for the products for review.